Who has a better leg kick/leg lift than Joey Bats Bautista? Now we know that a lot of Jose Batista’s power comes from his balance. 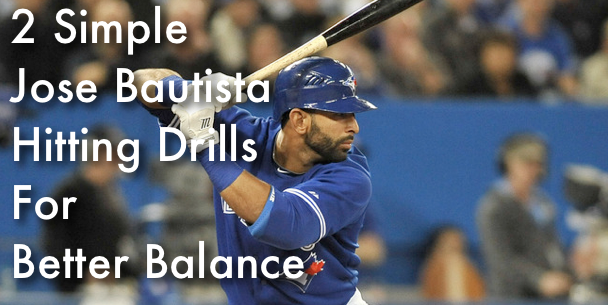 In this “2 Simple Jose Bautista Hitting Tips For Better Balance” video I will be sharing with you 2 simple baseball training/hitting drills and exercises that you can do that will take less than 5 minutes to become familiar with but will also take a life-time to MASTER. Once you do you’ll realize it was worth learning because as you develop your balance…..your swing will have a direct response to that development. Work hard and enjoy this baseball video! What did you think of this baseball video? Let me know what you’ve been working on with your swing as of late. I love hearing your stories! Remember…I respond to every single comment so don’t forget to say hi! Please hit the LIKE button and tell your friends about the baseball tips here at AoB!